Happy Saturday! It’s Judy here today to share an easy Mother’s Day project. Actually, it could be used for other occasions as well. 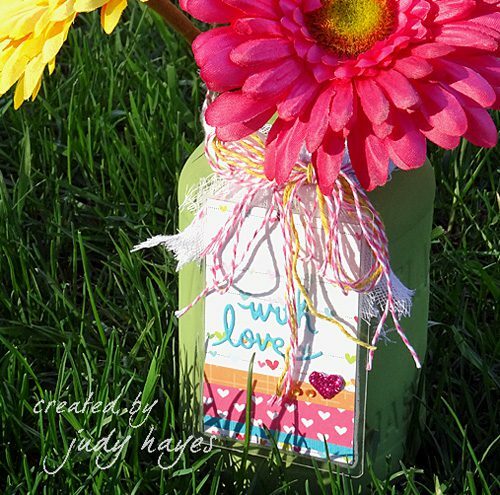 I’ve put together a fun tag to add to a mason jar filled with flowers. I’m using a recycled jar from spaghetti sauce. Any jar will work. I chose to paint it with spring green chalk paint. If there’s not enough time for that, simply use a clear mason jar maybe with some marbles or pebbles in it. Then add bright flowers! I cut a strip of gauze to tie around the jar top. 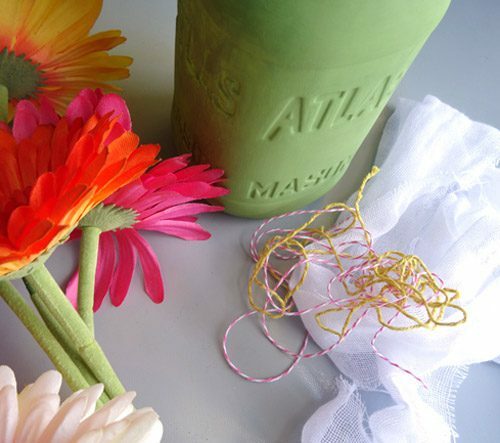 The pink bakers twine is perfect with my flowers but I wanted a touch of yellow, too. 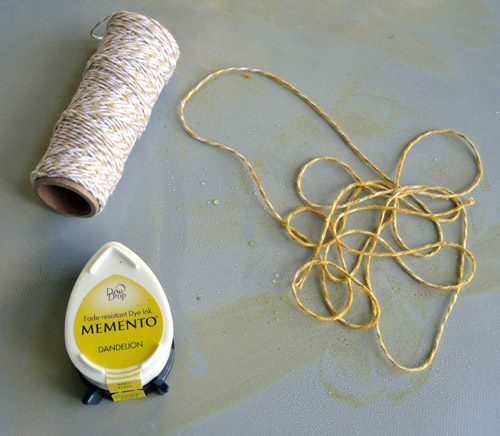 I applied yellow ink directly to the beige/white twine, misted it and rolled it in my hands to spread the ink. You can put the twine in a small plastic bag if you don’t want inky hands! I used my heat gun to dry it. I wrapped several strands of pink and yellow twine around the gauze and tied a bow. 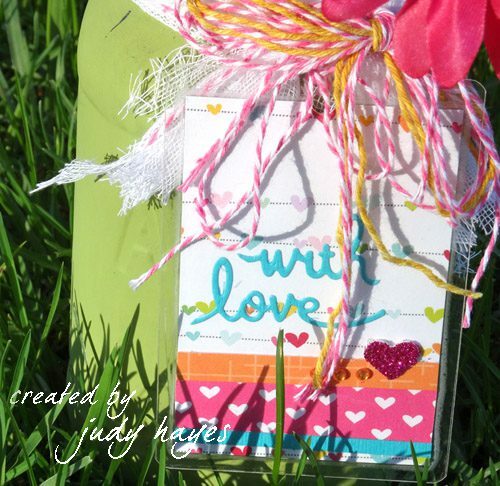 The Self-Laminating Pouches Cards Small from the HomeHobby Line are perfect for a tag. Using the 2¼ x 3½ʺ insert, I cut 2 pieces of patterned paper that were fastened back to back with E-Z Dots® Permanent Refillable adhesive. I wanted both sides of the tag to be the same. 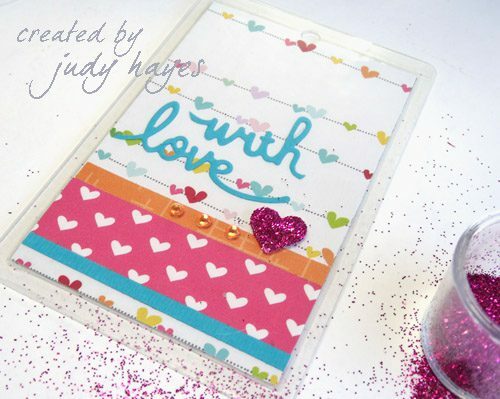 I added assorted strips of papers across bottom fastened with E-Z Dots® Permanent adhesive. 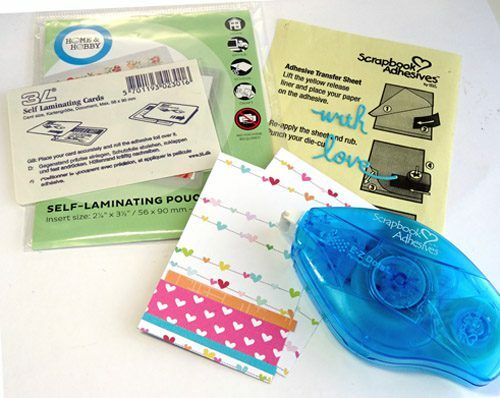 To add adhesive to narrow strips of paper, place them on scrap paper, run E-Z Dots® Permanent adhesives over strip. Strip will have adhesive on it and excess adhesive will be on scrap paper. I applied a piece of Adhesive Sheets 4 x 6″ to back of turquoise card stock. Then I die cut the words “with love” from it. Such an easy way to add adhesive to small die cut words! Simply peel adhesive backing and fasten to tag insert. To put insert in Self-Laminating Pouches Cards Small, I placed pouch face down on work surface, added insert face down and then peeled backing from adhesive and pressed over back of insert. I firmly pressed the layers together especially along edges. So easy! Next, I added a little Bling and a glitter heart! I placed a small 3D Foam Hearts on tag. I covered it with glitter, pressed it onto heart and then removed excess glitter. I added three rhinestones beside heart. I punched a hole at top of tag. With another piece of pink Twine, I tied it around the jar. It’s ready to brighten someone’s day! 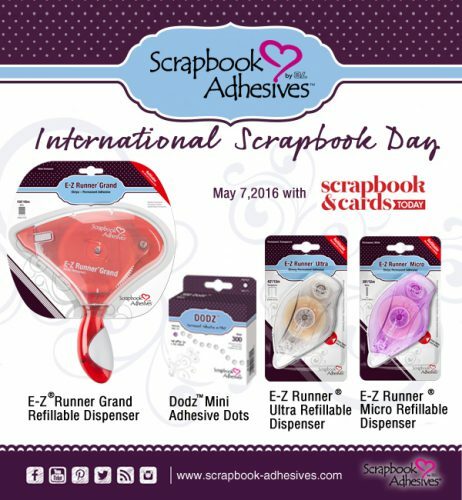 Be sure to visit Scrapbook and Cards Today Magazine for a day full of giveaways. We are scheduled for the 2:00 pm EST hour, visit and enter to win some of our newest products! This entry was posted in 3D Foam Shapes, 3D Projects, Adhesive Sheets, Adhesives, Crafts & Tutorials, E-Z Runner® Dispensers, Gifts, HomeHobby by 3L, Permanent Adhesive, Seasonal Craft Ideas, Self-Laminating Cards, Spring and tagged 3D Foam Hearts, Adhesive Sheets 12x12" (25 sheets), Adhesive Sheets 12x12" (5 sheets), Adhesive Sheets 4x6", Adhesive Sheets 6x12", Avery Elle, Cheesecloth, DecoArt, E-Z Dots Permanent, E-Z Dots Permanent Refill, E-Z Dots Permanent Refillable, Gift Tag, Giveaway, Glitter, HomeHobby by 3L, iNSD, Judy Hayes, mason jar, Mother's Day, National Scrapbook Day, NSD, Scrapbook and Cards Today Magazine, Self-Laminating Pouch Small, Spellbinders Paper Arts, Twine, Upcycle, Want2Scrap. Bookmark the permalink. One Response to "With Love Tag and Jar and NSD Giveaway!" Fun project. I would never have thought to dye twine.